Dampfree Baby Pure with activated carbon absorbs excess moisture and creates a healthy environment free of impurities. This powerfil absorber improves air purity to protect you and your baby from harmful allergens, chemicals, gases and odors present in every home and office. Yet is specially processed to ensure that it does not excessively dry the air, keeping the moisture level ideal for the skin. Highly recommended for reducing allergen & pollutant containing moisture in Baby's Room. 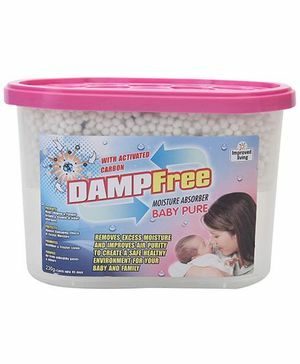 Dampfree Moisture Absorber - Baby Pure is convenient and easy to dispose off after use. It is safe for home, family and pets. The formula is non-toxic, septic safe and friendly to the environment. Remove Lid & peel off foil cover leaving the white safety paper intact. Replace lid. Keep on a flat surface in the required area. Crystals will harden and dissolve. Caution : Could Irritate eyes if touched by the crystals. For skin contact, wash with plenty of soap and water. If irritation persists, get medical attention. If ingested, get immediate medical attention.